A compact & robust table saw, designed to cut more than just wood. With the combination of power, optimised gearbox and multi-material cutting TCT blade, you have saw that will cut almost anything accurately & reliably. For safer operation when handling smaller off cuts. Accurate rip cutting, assisted by an adjustable parallel fence with measuring rail guide. Powerful 1500W hi-torque motor with optimized gearbox & blade system. 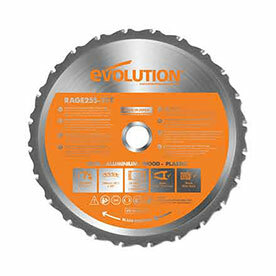 85mm depth of cut at 90˚ and 65mm depth of cut at 45˚. Integrated Dust port compatible for vacuum dust extraction. Compact & lightweight design with a 938mm x 642mm table surface. Japanese Tungsten-Carbide-Tipped (TCT) 255mm blade included. The arbor size of the R255MTS is 25.4mm.